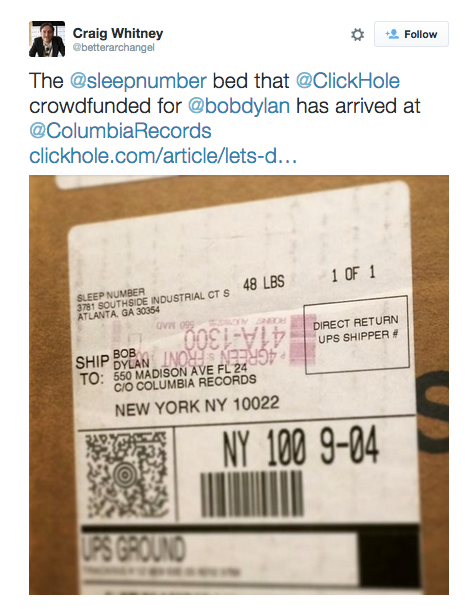 Clickhole, a satire website, has successfully raised over £1,000 ($1,500) to send Bob Dylan “a nice bed”. The website, an offshoot of The Onion, launched a GoFundMe page two weeks ago, outlining their aim. 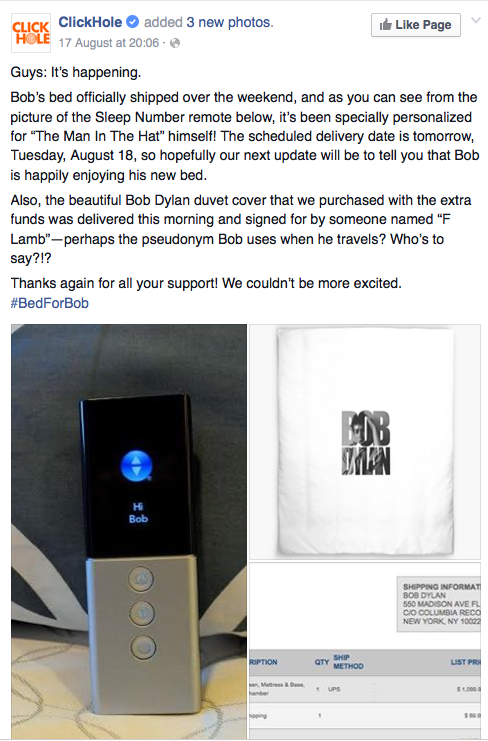 Yesterday – Tuesday, August 18 – the site confirmed the bed had been delivered to Dylan’s label, Columbia Records. In other Dylan news, a special edition of DA Pennebaker‘s documentary Dont Look Back is to debut in November, with a number of new extra features. Pennebaker’s documentary of Bob Dylan’s 1965 solo acoustic tour was first released in cinemas in 1967. This new edition from the Criteron Collection features more extras than have been included in previous releases. 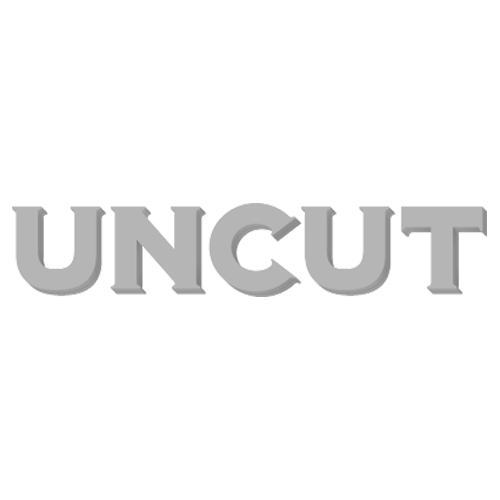 Examiner reports that the upcoming Blu-Ray and DVD editions will each feature a new digital transfer, improved audio and new artwork, as well as interview with Patti Smith about the influence of the film. The release date for this new edition is November 24, 2015. You can pre-order it by clicking here. Dylan is due to play a number of UK tour dates in October, including three nights at London’s Royal Albert Hall. In related news, Dylan producer Bob Johnston died last weekend: as a tribute to his great work with Dylan, Leonard Cohen, Johnny Cash and more, here’s an interview with Johnston from 2014 from the Uncut archive.